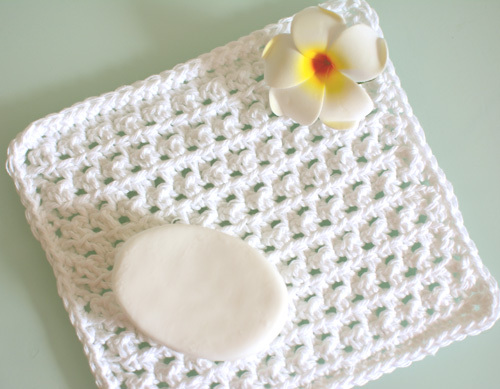 Crochet this spa inspired waschcloth as a gift or to keep for yourself! Pair it with a lovely bar of soap or in a basket with relaxing candles and other goodies. 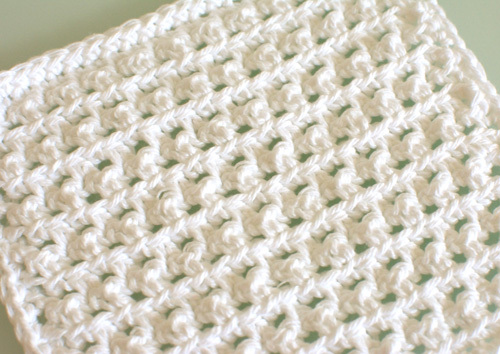 The washcloth is easy to crochet and is made with single and double crochet stitches. Adjust the size to make it as big or small as you desire using the instructions within the pattern. Choose cotton yarn for a super soft feel. Gauge Swatch: 3 1/2″w x 2 1/2″h (9 cm x 6.5 cm) ch 13. Work rows 1 – 2 in pattern. Then repeat row 2, 4 more times. Start by chaining 25, or a chain as wide as the desired washcloth. If adjusting the width of the chain, the number of chains must be odd. Repeat row 2, 14 more times or until the washcloth is as long as desired. Do not finish off, continue with border. Single crochet evenly around the washcloth, work 3 sc in the corner, then sc along the side of the washcloth until the bottom corner is reached, 3 sc in corner, sc across the bottom of the washcloth until the next corner is reached, 3 sc in corner, sc up along the other side of the washcloth until the top corner is reached, 3 sc in corner, sc across the top of the washcloth. Slip stitch into the first single crochet on the border to join. Finish off. Need help while crocheting your washcloth? Leave your questions below! This entry was posted on Monday, July 10th, 2017 at 12:00 AM by Rachel Choi	and is filed under Free Crochet Patterns. You can follow any responses to this entry through the RSS 2.0 feed. You can skip to the end and leave a response. Pinging is currently not allowed. Does the first single crochet stitch after turning go into the base of the single crochet after turning? Also does the single crochet at the end before turning count as a stitch? I hope this makes sense. Hello! The first sc on row 2 will go into the first single crochet on the row (the last one you made on row 1). The row will end with a double crochet stitch, since you are alternating from single and double crochet. The row will end with a double crochet stitch, since you are alternating from single and double crochet. Sc, dc, sc, dc, sc, dc, etc. Don’t skip any stitches or accidently add additional stitches. I just can’t get the count to turn out to 24 stitches………do you end each row with a double crochet. Then 1 single crochet turn? Each row will have 12 sc and 12 dc. The row will end with a dc. Is it correct that you start in second change from hook? Yes, on row 1 you will start in the second chain from hook. On row 2, you will work into the first stitch on the row, don’t skip any stitches. Are the stitches exactly the same in each row. Example: single crochet on top of each other. Double crochet on top of each other. In other words each row is exactly the same pattern? I want to thank you Rachel. I finally figured it out. I think my brain was not working. This is such an elegant looking pattern. I am going to make a spa set for my granddaughters for Christmas and include a nice robe. Again, thank you for all your help. I love your blog and it’s so nice to offer your patterns for free. Thank you for such a wonderful pattern, it was very easy to follow!